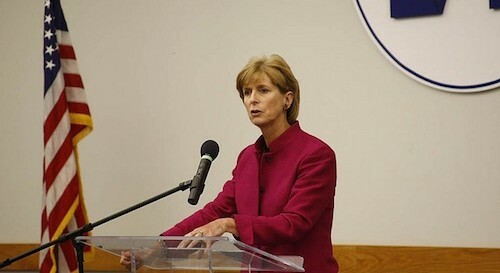 Former New Jersey governor Christine Todd Whitman (R), who headed the EPA under President George W. Bush, has written to President Obama’s EPA head, Gina McCarthy, to argue that the EPA’s proposed regulation to reduce the risks of explosions at U.S. chemical plants is too weak. Whitman writes that her purpose is “to urge the EPA to strengthen” its rule “to increase the safety of the American people,” particularly by requiring numerous high-risk chemical facilities to move to inherently safer technologies (IST). A chemical plant disaster could result from accident, natural disaster, or deliberate attack. The EPA has identified 466 chemical facilities in the U.S. that each put 100,000 or more people at risk. Whitman submitted her comment to the EPA on Wednesday, the same day that investigators with the federal Bureau of Alcohol, Tobacco, Firearms and Explosives announced that the April 2013 explosion at the West Fertilizer Company plant in Texas was intentionally set and not, as previously thought, an accident. That Texas explosion, which moved President Obama to speak at a memorial service for the 15 people who were killed, triggered a White House executive order aimed at reducing chemical plant dangers, which in turn led to the new EPA proposed rules. In the wake of the September 11 attacks, with growing concern about attacks on U.S. soil, EPA administrator Whitman drafted rules requiring IST conversions, where feasible, at high-risk chemical plants. But the plan was blocked by the Bush White House after lobbying by the chemical industry. Koch Industries have been the most aggressive lobbyists for such reforms for more than a decade. But the Obama White House owes no favors to the Koch brothers. In March I submitted a comment to the same EPA rulemaking process, co-authored with Lieutenant General Russel L Honore, US Army (Ret), the former commander of Joint Task Force Katrina, and Major General Randy Manner, US Army (Ret), former Acting Director and Deputy Director of the Defense Threat Reduction Agency. The generals and I argued, as Governor Whitman does, that U.S. chemical plants currently pose a serious national security danger. We warned that, while the Obama EPA’s proposed rule includes important measures to improve emergency preparedness, even more essential is prevention of a chemical disaster in the first place. And in this regard, the proposed rule falls well short. Our 100-organization Coalition to Prevent Chemical Disasters makes similar arguments in a comment that we delivered to the EPA today. And the members of the U.S. Chemical Safety and Hazardous Investigation Board, which is responsible for investigating hazardous materials incidents, also filed a comment calling for broader implementation of safer materials requirements. The EPA and the Obama Administration need to act on Senator Obama’s stark concern, as Governor Whitman’s strong new letter underscores.